Did Margaret manage to put the past behind her? 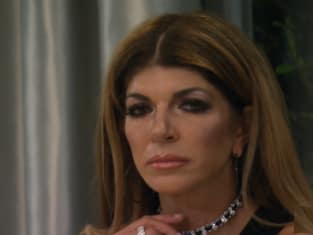 That was the big question on The Real Housewives of New Jersey Season 8 Episode 11 when Siggy made a decision about whether she was staying on the trip. Meanwhile, Dolores and Melissa tried to mend fences when they realized they were bickering over nothing. Also, Joe checked in with Teresa and the kids, but did Teresa make a shocking announcement to him? Use the video above to watch The Real Housewives of New Jersey online right here via TV Fanatic.